Now you can make your Whatsapp messages look different. There is a way that can change your Whatsapp font. Not everyone knows about this function. Hence, you might be the only one among your friends using this feature. Whatsapp added a new feature called FixedSys. This feature comes with every Whatsapp account. You will have to update your Whatsapp to add this feature. To activate this feature, just add three “` before and after your message. For example, a message saying “`How are you?“` will be converted into a new font. 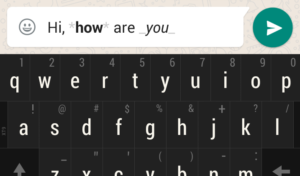 Whatsapp also also added a feature to write in bold and italics . This feature was added a while ago. To convert your Whatsapp font to bold add asterisks either sides of the word. To add italic font, add underscore.